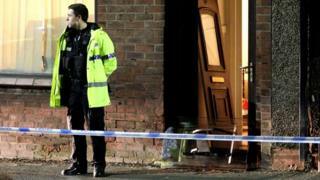 A man has been arrested on suspicion of murder after a woman was found with fatal stab wounds in a house in Greater Manchester. The victim, believed to be in her 40s, was found dead at a property on Manchester Road, Leigh, on Sunday. A 37-year-old woman has also been arrested on suspicion of assisting an offender. Police said the woman's death was being treated as an isolated incident, with no threat to the wider community.